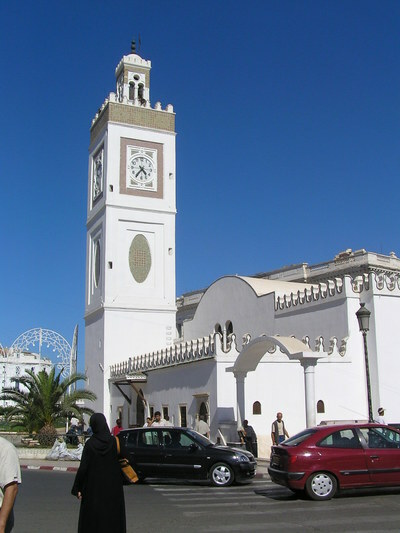 The 17th c. CE New Mosque (Masjid Al-Jadid), Algiers -- Photograph 2005 Via Wilkimedia Commons. ALGIERS — The landscape around Jizel, east of Algeria's capital Algiers on the Barbary Coast, appears like an artist's hidden paradise in some remote corner of the world. The view of the Mediterranean framed by the mountains is spectacular, and it tells me why the French fought so long and hard to remain here. From here the tumult in Egypt is both near and distant. It is near since Egypt played an eventful role in Algeria's struggle for independence, and as the most populous Arab state Egypt's political culture carries an appeal across the region despite its bankrupt economy. But the distance of Egypt from here also provides a critical perspective. Algeria is an oil-rich economy with about a third of Egypt's population. This relative wealth made the difference between Algeria turning into an Afghanistan or Somalia as Islamists bid for power in the 1990s, and the country remaining under control of a somewhat secularized military-civil elite that has ruled since France departed. The result of Egypt's presidential election discloses how greatly divided is the country. A mere 51% of the electorate voted and Ahmed Shafiq, as the candidate of the allegedly discredited previous military regime of Hosni Mubarak, received more than 48% of support. In winning the presidency Mohamed Morsi, the Muslim Brotherhood's candidate, has made history, yet the uncertainties of Egypt's economy looms ominously. Another round of elections, for the parliament was disqualified by the constitutional court, will have to occur. The military's role, given its stakes in society, will also need to be worked out in the midst of a failing economy, and in an international context wherein the margin of error is just about non-existent. Moreover, the sort of Islamist terror and military counter-terror played out in Algeria is not unlikely. The past is the prologue for the future in a society as divided as is Egypt. Most outside observers fail to understand or avoid discussing the fundamental nature of Arab society, which has failed to modernize or reform Islam sufficiently by discarding its tribal culture. Behind the public discourse of democracy, the real contest for power in Egypt, as it was in Algeria, is one among competing tribes to take control of the state and distribute its spoils. In Arab culture, the military has proven to be the most powerful of tribes. But the Muslim Brotherhood in Egypt since 1945 has posed a serious challenge to the military's hold on power. Seen from this perspective, the primary internal conflict in Egyptian politics remains the tribal contest between the military and the MB. The post-Cold War developments and the post-9/11 rise of Islamism affected the political equation inside Egypt. What we are witnessing is a new round of power struggle with stakes much higher for both Egypt and the region. My sense is Egypt's commanding generals shrewdly made their gambit as they sacrificed Hosni Mubarak, one of their own, to the mob. In stepping back, the military has permitted the MB with Morsi to assume the presidency with the narrowest margin of public support, and then hold them entirely responsible for the predictable economic collapse ahead. A year from now the mob that cheered Mubarak's fall may likely demand the return of the military.